Mod The Sims - How to change the default patterns from the cloned objects? How to change the default patterns from the cloned objects? Replies: 97 (Who? ), Viewed: 25563 times. So far i dont have any issues but one..
PS:Thank you very much Cocomama! It looks like there are different sorts of default textures. There are ones like objects_burned and empty overlay, they all have the same numbers and are the same textures, but they do get a new instancenumber when you clone renumbered. There also ones that have names that start with default like defaultMetal etc. And the other ones that definitely look like patterns to me. Taking a look in the Fullbuild2 package I think that the _IMG files are stored there, and the patterns too. 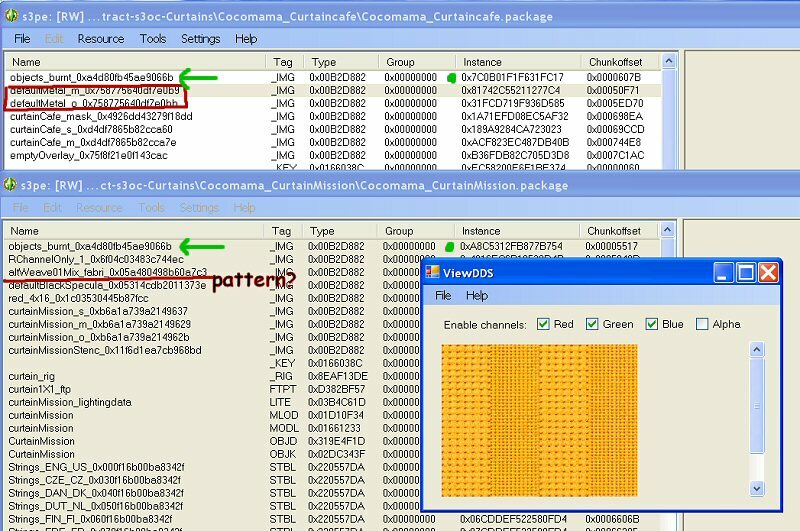 Maybe you can extract/export the default patterns (_IMGfiles) with S3PE from the TS3 clone and edit them or replace with other patterns exported from the fullbuild2. Maybe other creators already did something with replacing the patterns, and can help you further? I was able to change the default patterns, but I'm not quite sure how (don't laugh). I know what I did, but I don't know exactly what made it work. So I'm sure there are some things that I did that were not needed. If you clone a object and uncheck the default resources only box, there is a <patternname>_xml. I changed this to reflect the pattern/colour I wanted. I got that information from a recolour of my object that I saved and exported(shared). Then I changed the material/tgi blocks to point to the _xml. I also deleted the default recolours. I wish I could explain further, but I'm not quite confident with the process yet. It did work though, but if I try to go back and tweek it some more, the renumbering process screws it up. CMM do you have any idea if the method you used would also be useful for changing the existing patterns to ones the creator had made or if it could be used to add new patterns to an object? Any ideas on whether the method would work to add extra images to a painting? Thanks for that info cmomoney, very useful! I hadn't thought about it yet, but yes, yes, and yes. I actually just accomplished this last night, first on a EA clone (window blinds), then one of mine. But both had only one 1 pattern. I also changed my object to a custom pattern (tammytrauma's seamless wood). Maybe I should look at that clutter with the three pots, doesn't that have different images? I think the pots have multiple pattern choices. Have you looked at the paintings to see if they are amenable to your method of adding patterns to the choices? This would be a very nice addition to paintings. It would make them more like the paintings in Sims 2 were with choices of image. I haven't looked at the paintings, but I will. I'll also try to document everything I did, asap. Thanks much. If you could make it so paintings were recolorable by adding patterns to the choices in the main pattern selection thingy this would be a really significant thing IMO. I wonder how many patterns it's possible to add to a given object. The car painting: cloned, removed 4 default recolours (for testing purposes), added custom pic as a recolour and frame remains recolourable. 2. exported overlay _img (with car pic on it) and edited. Wrote down original instance number. 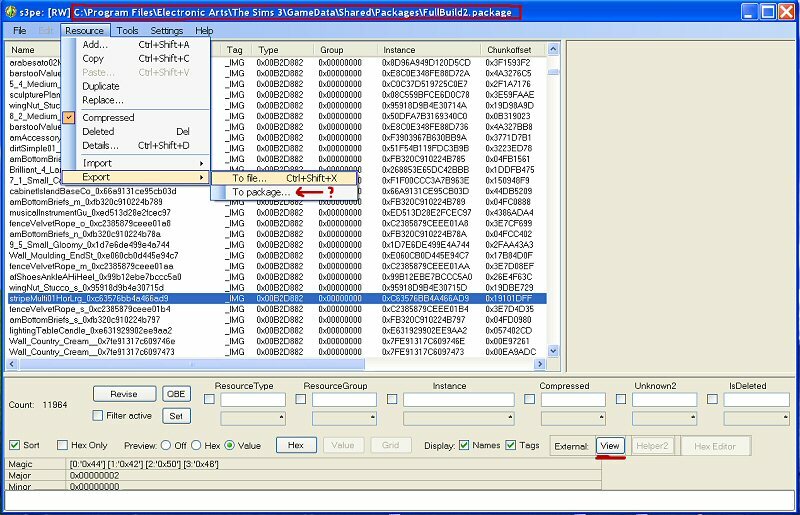 4. exported PaintingCars_xml. Wrote down original instance number. Opened in notepad and changed line <value key="Overlay" value="key:00B2D882:00000000: (new image's instance number)" />. 6. Opened OBJD in grid. Opened Materials (this is where I deleted the last for recolours, leaving 2). 7. Opened TGIBlock in Material (the 2nd one). Looked for original PaintingCars_xml instance number and changed to match my imported _xml. 8. Looked for original PaintingCars_img instance number and changed to match my imported _img. save, ok, commit. Saved package. Last edited by cmomoney : 4th Nov 2009 at 4:23 PM. That is exactly what I was talking about. Very clever work Thanks for the explanation of how to accomplish this trick too. This is great! Wow, do I understand correctly that you added a new painting option to a painting that only had one? That's fabulous-- I've experimented with using something like the kitchen crockery to do that, but this is much much better. I'll have to go try it! 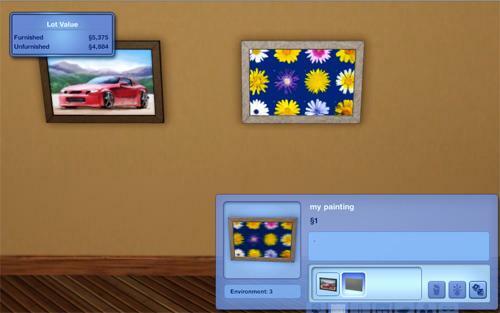 Paintings in Sims 2 Style! I have a couple of questions about this process of adding images to the paintings if anyone can help. First, where is the xml? Is this something we get from s3pe? Second, what is "grid". Is this another tool? The xml will be included when you untick the default resources box. Grid is part of s3pe, a little button on the bottom half of the app. Next to the view button, rougly. I am going to add on a pattern question, can we make patterns and assign them to misc? The category that is empty basically. Then we could have actual photo art that could be applied to the canvas channel? They have four recolorable channels. Is this what you meant? I'm not sure if the method described here would allow you to apply a pattern to the canvas with CAS though. I think what this method does is make the paintings like they were in Sims 2 where you have multiple choices that are in the box that pops up when you select the item. I think if you want to apply patterns to a painting that you would have to choose one with a frame, edit the alpha to make the frame space bigger and use the frame space as the canvas instead. I've been wanting to try this myself but I still havn't solved my alpha deficiency yet. I don't need but one channel since I want artwork. But thanks for letting me know they can go in Misc, that solves one part of the dilemma. I am going to revisit the adding of a channel to see if it can be done. Jonesi has made a canvas that takes patterns, but I want actual artwork with frames. You wouldn't need to add a channel if you used the wall towels I think. That thing has two channels and the bar the towels hang from. You could just mesh your own frame and canvas or swipe one of EA's and replace the towels etc. with that. Again though, I think this might require some alpha editing which is why I haven't done it. Your other alternative would be to choose some basic color for the frame of an EA painting and make that part non-colorable. That wouldn't be as nice I suppose. Here's the package result of the modified car painting. Thank you very much. It will be helpful to use this as an illustration of what needs to be done. No problem, OM. And playing with layer masks (PS/Gimp) could help you get over the alpha deficiency. They work the same way and you can see the what your doing. The McBob painting has 10 default patterns, plus you can add customs, so who knows how many you could have. HL: Couldn't what you're trying to do be done like BabaYaga's deco plates? If I understand Huge Lunatic correctly she wants higher quality for the picture part of the picture than it's possible to get with patterns? The way the patterns are put together with the RGBA channels makes it hard to get that much detail in the color. I was wondering... we can delete the default recolors now, can we also change the default recolor the cloned object uses, and replace it with one of our own? Is it the same method that is used to put a new painting picture in the frame? It should be the same principle shouldn't it? In step 2: "exported overlay _img (with car pic on it) and edited..." you would still be just overwriting the original IMG with a new one so it shouldn't matter what the specific object is, painting vs. something else, that you're working with. 2. Edit the XML (of the object) to use the instance number of the pattern I'd like it to have. How would I change the colors that the patterns uses? I'm actually just looking to edit the recolor (like you can in the CTU, you can choose what default color combination shows up, that's what I'd like to do). If this is the way, then I'll test it out. Because I thought an overlay is an extra texture that gets put over the pattern that you choose in the CAS.